Plotting comes with modern features to utilize in building your creative agency website. All the trending design components for creating websites are incorporated in Plotting – Creative Agency Template. Visual front-end elements like illustrative image banner, contextual sleek slider, video integration, categorized portfolio arrangements, client feedback slider with social references, contact forms – all these make Plotting stand out unique to its kinds. One-Page presentation of these design components, meant for showcasing services and portfolios of your creative agency, will take your business experience to another level. Who Is This One-Page Template Useful For? Plotting exclusively serves the purpose of Creative Agency, Small Business, Start-Up Company in terms of creating websites in order to attract potential customers as well as to stay engaged with existing clients worldwide. The businesses can essentially make their web appearances creating websites with Plotting – Creative Agency Template. They can offer the services with great contents and showcase their works presenting Portfolios in different categories. Moreover, a consistent customer engagement can be ensured with social networks, client feedbacks and recommendation as well as with other effective contact systems. Responsive Creative Agency Template Built in Bootstrap– Plotting is crafted in the newest version of Bootstrap – the most popular front-end design framework. As a result, the template layout is responsive to various screen sizes. So the website built with Plotting – Creative Agency Template responds equally when viewed from different devices and various web browsers as well. One-Page Template Best Suited for Creative Agency Websites – Industry experts find that creative agencies, small businesses etc. are most comfortable in portraying their services, features and portfolio in One-Page website style. 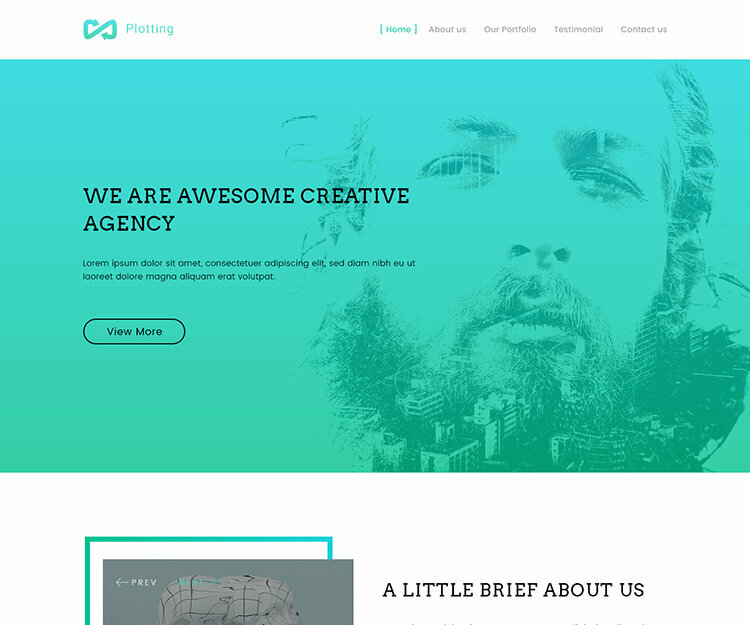 Plotting – Creative Agency Template has also been designed with that trend of website layout in mind. All the essential components for an agency website are integrated in a one-page layout in Plotting, so that the customers and clients have a modern experience dealing with the business. Trending Creative UI Elements – Plotting comes with contents that are blessed with modern User Interface elements – all accumulated in a consistent visual perspective. The creative styling of typography, buttons and icons, images and videos, navigational items, forms etc., powered with trending CSS transitions and effects, has just given the over-all look of the template an aesthetic feel. Consequently, the clients and customers are meant to have a convenient User-Experience in terms of accessibility. Customizable Contents with Well Documented W3C Valid Source Files – Plotting – Creative Agency Template comes with W3C validated source files that ensure the maximum Web Standard in terms of coding. The files are also well commented so that the developers may find particular elements to edit easily. Therefore, you can have your contents customized with the preferred elements according to your business needs and requirements. Cross Browser Compatible SEO Optimized Components – Special care has been taken while crafting the several elements of Plotting in order that they can be crawled and indexed by popular search engines without any errors. Additionally, the template has also been tested in various web browsers and their different versions to ensure a bug-free uniformed appearance. Communicative and Social Friendly – Communication and social engagement is allowed to prevail to its greatest height with Plotting – Creative Agency Template. So the website created with Plotting can be expected to effectively communicate and engage socially with customers and clients, only to flourish the business and take the success to the next level. And Lot More – Plotting offers several other features highly recommended for small businesses, creative agencies, portfolio-based companies who want to showcase their services and features by the means of a stunning website. Looking for website templates for a different interest? You might as well check out other Premium Templates by EcologyTheme.